We’ve been learning about how to find the area of rectangles in math. In order to find the area, you must multiply the length and the width. In the rectangle above, we see that the length is 8 inches and the width is 6 inches. In order to find the area, you must multiply these together: 8 x 6 = 48. Therefore, our area is 48 square inches. We say square inches because you could draw squares inside of your rectangle that are an inch on each side. If you counted up all the squares you made, you’d have 48 of them! Sometimes, you may find an irregular shape (such as a room in a house). In order to find the area, you have to split it up into separate rectangles. Find the area of each rectangle (length x width). Then, add those together. That will give you the total area of the shape! In the example above, you can see that the polygon is not a rectangle. So, we need to draw a line to make rectangles (dotted green line). 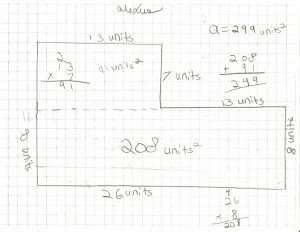 To find the area of the larger rectangle, we multiply the length x width: 8 feet x 8 feet = 64 square feet. Then, we find the area of the smaller rectangle: 5 feet x 4 feet = 20 square feet. To find the total area, we add those together: 64 square feet + 20 square feet = 84 square feet! To help us better understand how to find the area of different shapes, Jenna and Ben from Avery Realty, created a video. They’ll share with you how you could find the area of rectangular and irregular shaped rooms in a house. Did Ben and Jenna’s video help you understand area? Can you find the area of anything else besides a room? The video helped me out a lot. I have a big maths test tomorrow and I am not looking forward to it. I live in London in Coventry. I really like your video. Ben and Jenna did an amazing job. The way we make videos to help teach other people is really cool. I totally agree! Jenna and Ben did an excellent job explaining the how to find area. They are pros at it. They taught me to find the perimeter and area in a better way. Keep up the good work! Now I know a little bit more how to do area. Every time you do a video it helps a lot of people. Already 47 comments, your blog is very famous. I know that you can find the area of anything you want because everything has a length and a width. We thought the video was very helpful to understand area, especially for irregular shapes. How did you get the idea to make a video for math? Thank you for watching our video! We’re really glad that you enjoyed it! In class, it’s been brought up that it’s sometimes easier to learn something by watching a video first. We decided that maybe we could help others learn by creating videos of concepts that we found somewhat difficult! As we continue on throughout the year, we’ll be creating more. We hope you’ll continue to come back and visit! I like your way of finding the area of a rectangle. Amanda’s grandfather was great at that. He could look at a room or a set of plans and give you the square footage by calculating it in his head. Good work kids. I thought the video was fun to do in class. I was so nervous to do it and I thought it was fun in the end. I hope the video helped all of you. Hi! We’re from Mr. Miller’s class and we just wanted to say thank you for leaving a comment. Well, we really appreciate all your comments and keep commenting on the blog. Thank you. Ben and Jenna did a great job! I am starting to get area. The video was very interesting. I enjoyed reading thru your blog entries and seeing what your class has been doing. Mike’s Uncle Greg in California. Thank You for writing on our blog. How is Max? How is California? How are you? By the way, our favorite class book is the BFG! We had a Roald Dahl Day last year. We want to see the movie trailer you make! We love Roald Dahl! We read The BFG together as a class but many students read other Roald Dahl books all on their own! We enjoy your blog as well! I’ll be adding you to our blogroll and hope you add us to yours! Will says: It’s a good video for learning. Jordan says: You guys did great Jenna and Ben! Samir says: It must have taken hard work doing that! Ray says: You guys could be on the news, you are so good! Grace says: How did you erase the board so fast? We’re so glad you got to watch our video! The students made it to help others better understand how to find area. @Will, Jordan, Samir, and Ray – Thank you so much for your kind words! We’re glad you enjoyed it! @Grace – We took a few different videos and then put them together at the end. We didn’t really erase the board that fast. It just looked that way! I wish I could do a math movie too. My cousin wrote on the blog and so did her friend. In the future I would like to do a math movie. I heard it’s really fun. Jenna said she was nervous but fun. We miss you Ms. Mayo is here. She is so nice. I think the video Jenna and I did will really help kids to find the perimeter of things. I think 32×27=864inches sq. I think you can find the area of a computer, a bubble letter, and a folder. 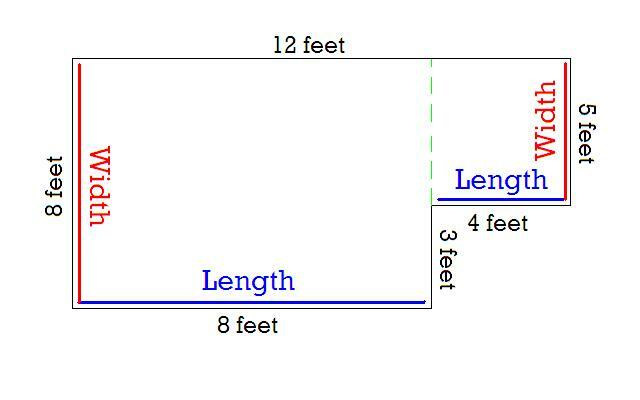 If the length of a rectangle is 32 inches and the width is 27 inches then the area would be 864 sq. inches. If the length of a rectangle was 42 inches and the width is 52 inches. What would be the perimeter and the area be? This is a brain teaser! You guys are so smart! That was a really long problem – Jenna and Ben did a great job remembering all the steps. It looks like you have a lot of fun in Mr. Avery’s class. Keep up the good work. I really liked the video. When it was starting, the music sounded very ominous – like the beginning of Star Wars. The cute little symbol and music at the end was really cute too. But what I liked the most of all was the MIDDLE — Jenna and Ben! You took a tough subject and really broke it down. I liked it a lot. I’ll bet there are some adults that would have to think really hard about how to do an irregular room like what you did. Nice job! I’m glad you are learning about finding area. I am a builder and I use those skills every day! Natalie showed me your blog and I was very impressed. She said that the video explaining area was extremely helpful to her in understanding the math concept. Keep up the good work. I know that I have not been on this like I was but that was because I have girl scouts and basketball. I decided to write every Monday. That video about area was impressive. I like how they showed the easier sets and then the harder ones where they added them together. Did your class just learn this or a long time ago? My class learned it about 3 months ago. I think these videos are a fun way of learning. They are also great to get kids working and they will have an awesome time doing it. I’m Millie from Pams class in South Australia. I thought that you video was great! You explained the concept of area really well! I loved the way you set out your text! It was easier to understand because you highlighted the numbers in colours! I think the answer to the 32inches x 27inces is 864 inches. Am I right? We hope you keep coming back to visit. We’ll be making more videos throughout the year! I’m Natalie. You are right! 32 inches times 27 inches equals 864 inches! Can you figure out what the perimeter would be? Great explanation guys! Good job. Thank you so much for a fantastic demonstration about how to calculate area! Figuring out the area of square rooms is fairly easy, but the irregular shape ones are tricky. I like how you broke the room up into sections to easily figure out the rectangles. You asked if I ever find the area of anything else besides a room. Well…my husband and I are trying to buy an area rug for our den. First, we discovered that rug stores sell area rugs in many standard sizes. We are looking at rugs that are 8′ X 10′. Rugs actually come in numerous sizes, but those dimensions seem to work for the shape of our room. Thanks for a great demonstration, and if I ever move to your town…I’ll be sure to use Avery Realty to purchase a house! Thank you for sharing about your area rug for your den. We found out the area of your rug in class. If your rug is 8 feet x 10 feet, your area rug will cover 80 square feet! That’s a big rug! Great work! It looks like you all are really getting into it. I was very impressed with the effort and information in the endangered animals piece. Keep up the great work and I will be tuning in often to see what other exciting things you are learning! You are all working so hard and I am so impressed by the videos. Let me know when your next production is so I can come in and see how it is done! We will definitely let you know when our next video is being done. We try to do one each month. We should be doing one soon but it won’t be a math one. We’re going to make a movie trailer for the book The BFG. We made another two movies. One about The Big Friendly giant, and one about the Avery Bunch. The BFG movie trailer is based on the real book. Roald Dahl was the author of the book. The Avery Bunch is based on the Brady Bunch except, the Avery bunch is working with fractions. It was very fun to sing and shoot. Ben and Jenna did an AMAZING job explaining area! Our class will be studying area after we tackle long division. We will definitely watch your video. Thank you for sharing! We study area a little bit in the spring, so I’ll share this post with my students then. In the past we have done a project where we build kites and have to figure out the area of the sail. If we do it again this spring I’ll contact you to see if you want to join the project. I was wondering where you teach. I was also wondering how much of a time difference there is between where you live and where I live. We would love to do a collaborative project with you in the spring with kites. That sounds like so much fun. Thank you for always leaving us comments! Thank You for writing on our blog. How was the kite project? That sounds like fun. Maybe we’ll be watching one of you on Fox news cast in the future. Great job. I am very impressed with the talent this class has. What a fun way to learn. I am a teacher in Missouri and my fourth graders will love this post on area. I am going to show them Ben and Jenny’s video, too. Sometimes it really helps students to hear another student explain something. My class is working on a museum exhibit and looking at a a floor plan with an irregular area to fill with items. We have to be sure everything fits, so we are using area a lot. There are so many good reasons to understand how to figure out area. Thank you!!! I understood the videos more. I wonder if you teach my cousin because she is in fourth grade and I think she lives in Missouri. Her name is Jennifer. Sorry, Natalie. We do not have a Jennifer in our school in 4th grade that I know of! I also need to apologize to Jenna- I called her Jenny!!! I don’t care what you call me as long as it has Jen in it. Some people call me agenda even though it doesn’t spell Jen. I hoped your class liked the video that Ben and I did. I thought the video was fun but I was nervous. I love the idea of creating a museum exhibit for area. I think this would be a great collaborative project next year! We could work together on a museum or each class could create their own and then we could virtually visit each others museums! Awesome video! Love the music at the start. You are very clear, showing all the steps. I wish my math teachers had used videos like that when I was learning how to figure out area. Thanks! I like the music at the beginning too. I am amazed at how much electronics improved over the years. They’ve improved a lot just since I started school! As soon as I saw the video I knew how to do area. It was a great learning video. Jenna and Ben did a fabulous job. They were amazing!